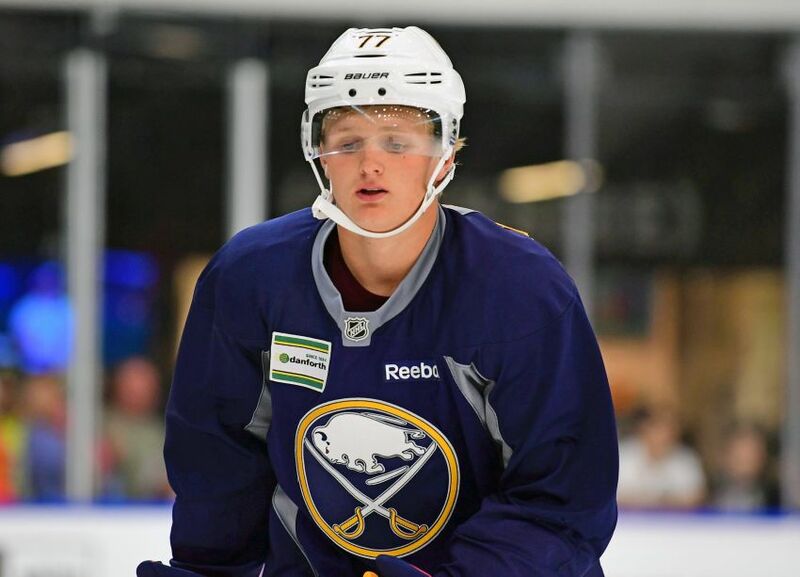 BUFFALO – Right away, center Casey Mittelstadt’s new teammates reached out and welcomed the slick prospect to the Sabres. So shortly after Mittelstadt signed his entry-level contract Tuesday, center Jack Eichel took him to lunch. Hours later, winger Sam Reinhart had dinner with Mittelstadt, his new linemate. Mittelstadt, 19, will make his NHL debut tonight against the Detroit Red Wings inside KeyBank Center. In a miserable season widely regarded as the franchise’s worst ever, the youngster’s arrival has generated some much-needed excitement. The pressure on Mittelstadt to perform is already enormous. While the eighth overall pick in 2017 enjoyed a terrific freshman season at the University of Minnesota, he was playing high school hockey just over a year ago. Less than 13 months later, Mittelstadt jumped to the world’s best hockey league without the benefit of a training camp or any acclimation period. His teammates want to help him adjust to NHL life, something he appreciates. Coach Phil Housley cracked the Sabres just months out of high school in 1982, the beginning of his Hall of Fame career. He understands how important mentors can be. With only six games left, Mittelstadt probably won’t be moving in with anyone. Still, the time will be beneficial. “It’s going to be great for him to get used to the players that are surrounding him, being one of the guys on the team and feeling comfortable in that role and getting used to our systems, just getting used to the NHL game,” Housley said. The last-place Sabres looked energized by Mittelstadt’s presence during Wednesday’s practice inside HarborCenter, showcasing more energy than they have in weeks. It’s amazing what beating one of the NHL’s best teams, a day off and adding your top prospect can do. “You win a game and you get a day off and you come back and you feel a lot better about yourself, and especially the team that you beat, a really good team like Toronto,” Housley said. Housley put Mittelstadt between Reinhart and Evan Rodrigues, an intriguing scoring line featuring skill and speed. Mittelstadt also manned a point on the No. 2 power play. “I got to see it firsthand today … the speed and skill he possesses,” Reinhart said of Mittelstadt. Mittelstadt hasn’t played a game since March 3. However, he kept practicing with the Golden Gophers before the school was eliminated from the NCAA tournament. He also skated on his own last week. Perhaps expectations should be tempered a bit. Despite the layoff from game action, Mittelstadt’s speed impressed Housley. Mittelstadt said once the game gets closer, he’ll likely get a little nervous and antsy for it to start. Sabres goalie Linus Ullmark, who missed Monday’s 3-2 win in Toronto after suffering an upper-body injury, practiced Wednesday and is day-to-day, Housley said. Meanwhile, center Kyle Criscuolo, out since suffering an upper-body injury March 5, is back practicing. Winger Kyle Okposo has been named the Sabres’ nominee for the Masterton Trophy by the Buffalo chapter of the Professional Hockey Writers’ Association. Okposo, 29, returned this season after suffering a concussion forced him to be hospitalized in intensive care last year. Step one, check. Now on to the next 25 steps.